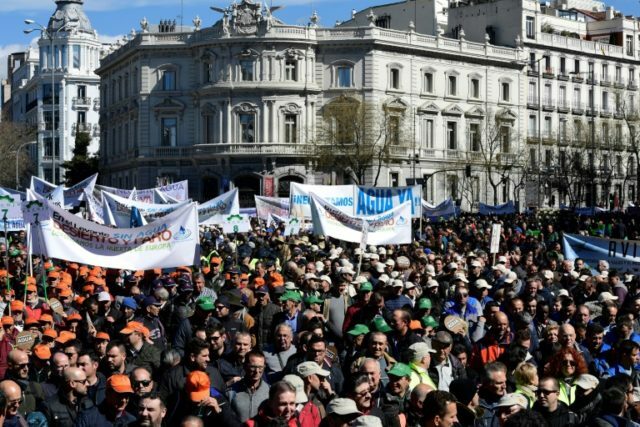 Madrid (AFP) – Thousands of farmers from Spain’s parched southeast, marched in Madrid Wednesday to ask the government for help as their crops are threatened by a “surreal” drought that is also putting jobs at risk. The region that goes from the cities of Alicante to Almeria, part of Spain’s so-called Levante coastline known as Europe’s vegetable garden, has been hit hard by the worst drought in decades. According to the latest official data published Tuesday, the Jucar and Segura rivers that flow into the east and southeast are at 27.7 percent and 17.6 percent of capacity respectively. “Without water in the Levante, desert and unemployment. Defending Europe’s vegetable garden”, read one banner carried at the march in the Spanish capital. “They’ve cut 80 percent of our water supply,” said Jose Antonio Diaz Navarro, 38, manager of a company that grows lettuce and watermelons in Almeria province and neighbouring Murcia, as authorities ration water. He said that as a result, they have so far only been able to grow 15 to 20 percent of what they would normally, calling it a “surreal” situation. Diaz added it had become so desperate for some farmers they were considering re-locating at least part of their crop to the Montpellier region in southern France, where there is water. The story was similar for Pepe Rodriguez, a 59-year-old farmer from Totana in Murcia. “I’ve not experienced such a bad year in 39 years,” he said, pointing to the potential for entire livelihoods to be destroyed as well as jobs lost for many migrant workers who eke a living out of farming — some of whom were at the protest. Rodriguez called on the government to help, first by subsidising currently expensive desalinated water. In the longer term, he said water from northern Spain that often runs out to sea after heavy rainfall could be deviated down to the south.